Those possessing an interest in American Architecture have been exposed to an inordinate number of books about Frank Lloyd Wright within the past 20 years. The subject matter varies from large-format photographic essays to a recent book “tell-all” concerning those who assisted him in his later years. Incredibly, very little has been written about the more technical aspects of his buildings, i.e. how the buildings were actually put together. In studying Wright, one quickly learns that his revolutionary architectural forms were built using equally pioneering methods of construction, use of materials, mechanical systems and interior finishes. Renewed interest in the architecture of Frank Lloyd Wright has inspired owners and not-for-profit organizations to restore many of his buildings. Accordingly, architects and historians have rediscovered a variety of design and construction methods employed by Wright which were previously either forgotten or lost over time. Always an innovator, Wright utilized structural methods that were sometimes entirely new to the construction industry. Interior trim, plaster finishes, lighting and mechanical systems were rethought and new techniques were developed, some of which are commonly used today. Wright appears to have been constantly changing and rethinking these issues throughout his career, and the progression of his development of design gives one an insight into the thoughts of this great architect. 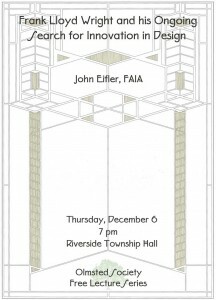 John Eifler is president of the architectural firm of Eifler & Associates. He received a Master of Architecture degree from the University of Wisconsin and a Bachelor of Science in Civil Engineering from Valparaiso University. Mr. Eifler began practicing architecture in the Chicago office of Skidmore, Owings & Merrill, where he worked from 1979 to 1989. The office of Eifler & Associates was established in 1990. The firm has been responsible for the restoration of a number of noteworthy buildings designed by prominent Chicago architects such as Frank Lloyd Wright, George Maher, Walter Burley Griffin, John Van Bergen and Louis Sullivan. Mr. Eifler’s practice includes both new construction and restoration work. His firm recently completed a contemporary home in Door County, Wisconsin, and recently restored a Georgian “cottage” in Newport, Rhode Island. Current projects include improvements to Thorne Estate in Lake Forest, Illinois, a substantial new home in Rockford, and the improvements to the Tomek House in Riverside. 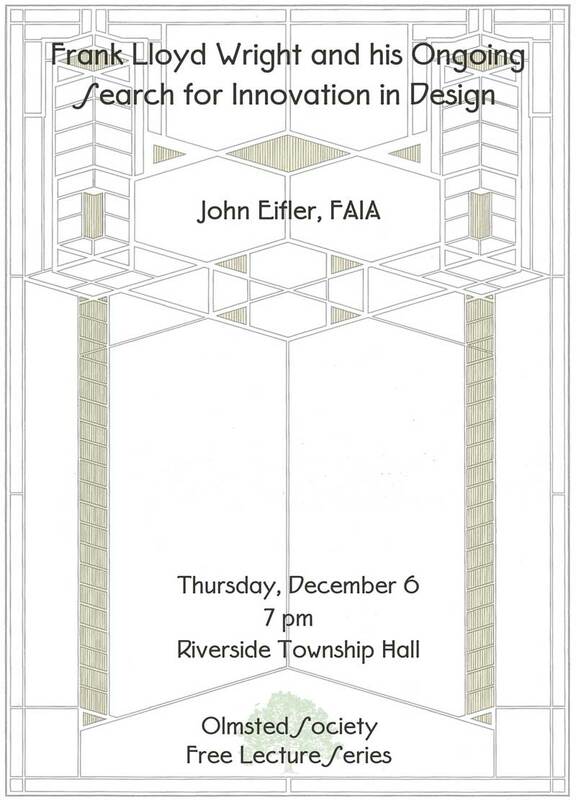 John Eifler has served as a board member of the AIA Chicago Chapter, Landmarks Preservation Council of Illinois, and The Frank Lloyd Wright Building Conservancy. 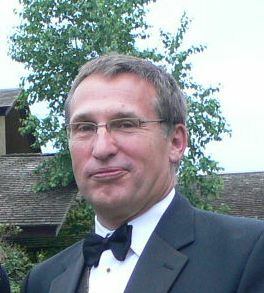 He was bestowed the honor of a Fellow in the American Institute of Architects in 1999.